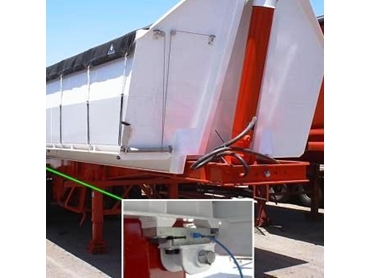 Onboard Trailer Scales have been installed onto a tipper trailer that carts grain in South Australia. The Onboard Trailer Scales are used to ensure the client knows the weight of grain being loaded onto the trailer without risk of incurring fines for accidental vehicle overloading. The PM Onboard Trailer Scales kit supplied to the trailer manufacturer included two load cells fitted to the tipper trailer’s rear hinges with another pair of load cells mounted under the hydraulic ram at the front of the trailer. The weight readings for the Onboard Trailer Scales are generated by a digital weight indicator mounted in the truck’s cab. These Onboard Trailer Scales were supplied with the optional hand held remote control to allow the driver to supervise the loading of the trailer from outside the cab. The remote control displays the current weight of product in the trailer and has keys for zero and print functions to allow a weight ticket to be generated using a printer mounted in the cab. PM OnBoard is a UK based company that specialises in engineered onboard weighing systems for bulk tipping rigid, semi-trailer and drawbar vehicles. Accuweigh are Australia’s OnBoard Weighing Experts and have eight branches across Australia ensure local state based after sales support is available in all mainland states.